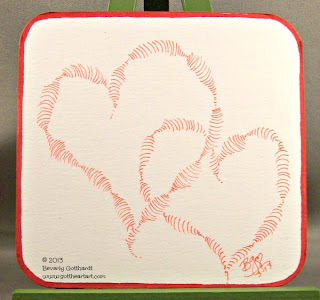 Zentangle® usually doesn't require your tile to be something. It's kind of like cloud gazing, you can see all kinds of images, but this tangle seemed to cry out for a design. These double hearts in red just came off the pen and then I had to add the red border. Click over to Mindful Creations and check out all the other artists interpretations. This tangle is great for the hearts. Wonderful approach to indy-rella, I love the simplistic use of it. Thanks for Joining the adventure!